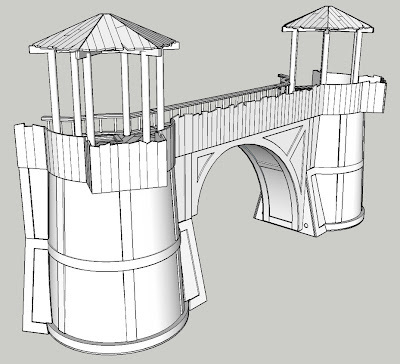 So I've almost finished the Benan Wachtower and turned my hand to the Stockade walls, and then I realised that to keep this modular the walls really need to be the same length as the Tew-Fah bridge so that they tessellate properly. 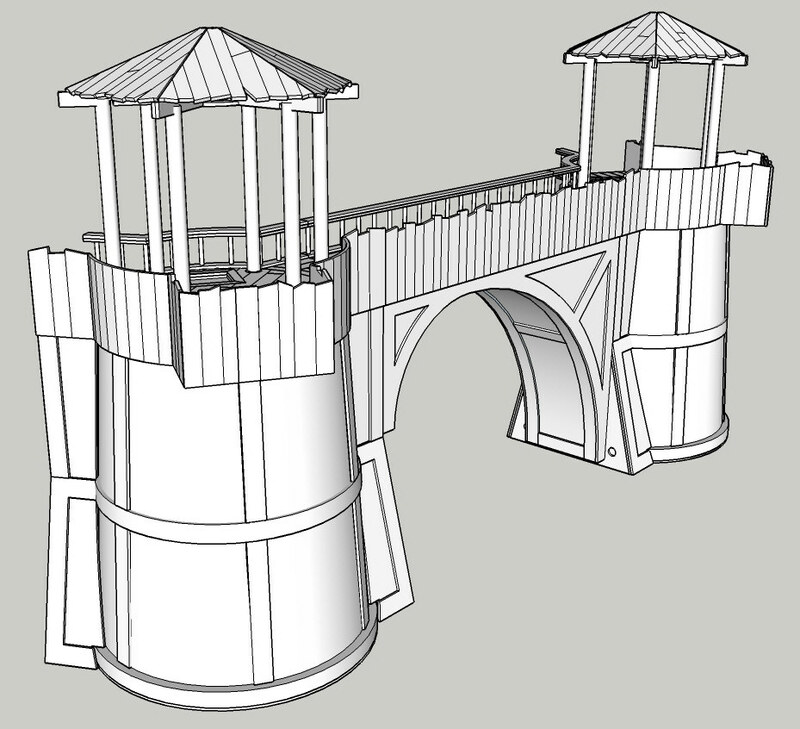 The size of the bridge itself is defined by the radius of the two arcs under it, and the arcs are defined by the floor heights and the pallisade depth on the watchtower. So I ended up having to redo the whole bridge! That might not look too impressive, but now i'm sure it will meet the Benan Watchtower properly so that the railings and the pallisade meet properly. 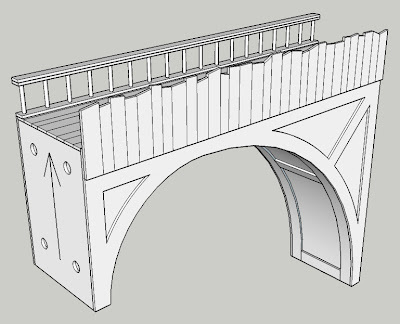 Each bridge will be sold with one side as railings and one side as pallisade. This gives an idiosyncratic look which i think matches the buildings but also means that it can double as a gateway between two Benan Watchtowers, with the pallisade facing outwards to match the towers and the railings facing inwards. Multiple bridge kits would then enable a bridge to be built with pallisade on each side or railing on each side. I had to do a bit of a rethink on the magnets position and will have to change the locations on the tower, but now the walls, towers and bridges will all match. The tricky bit of this was to get it onto a single sheet of A4 styrene! I've *just* managed it, it's an incredibly tight squeeze. It should be OK as long as the closeness of some of the parts doesn't cause heat issues and therefore bending. The fact that this is a single sheet should mean that I can keep the price to around the £5 mark. Oh, and the obligatory assembled to a couple of Benan Watchtowers picture.